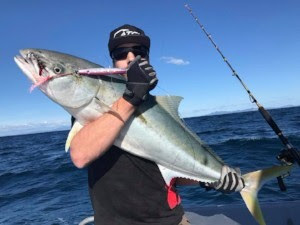 It is that time of the year again when the kingfish just steps up a notch and so do the sharks, whats kept us a little shy of fishing the Alderman pins. 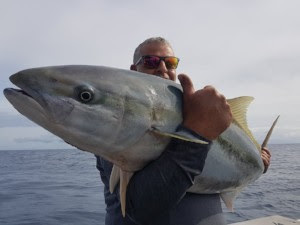 So of late we have concentrated our efforts in the northern and the Mercury Island region with some great results in numbers and size at times. 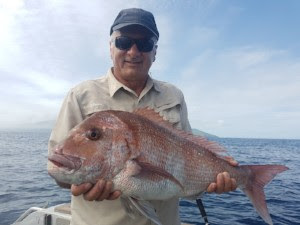 And as far as snapper are concerned they seem to be coming on stronger every week as they do this time of the year on the eastern coast of the Coromandel. 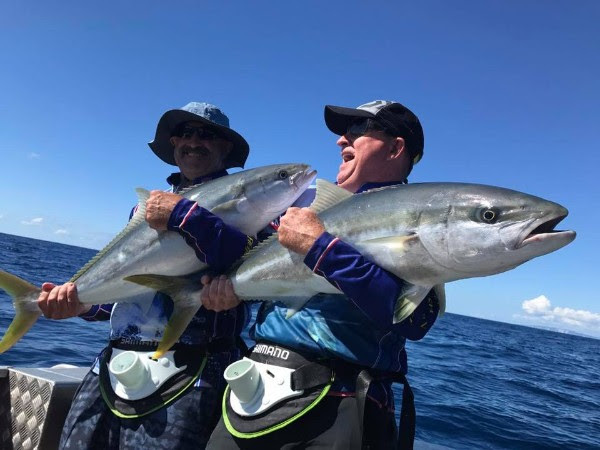 The blue water has been close in at times what can make for an awesome day seeing your fish come up from 20-30 metres below the boat with beautiful crystal clear water. 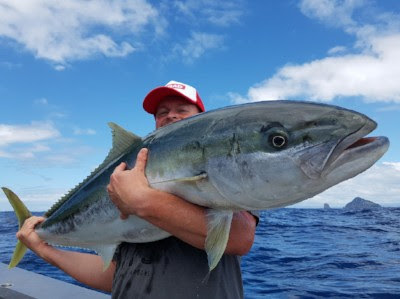 As far as bait for us it has been awesome with the occasional cyclone coming through to keep you guessing your first day back on the water to find the little buggers. 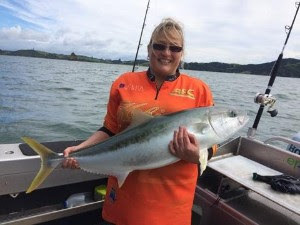 All in all the fishing has been consistent and it is not hard to find a kingi or two where ever you go. So here we go heading into my favourite time of the year for the next two-three months and we will be seeing some awesome fishing, fingers crossed the weather holds it together. 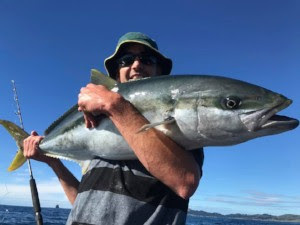 Well it’s been a good summer out of Whitianga over these last few months, the weather has had its days but the fishing has made up for what we’ve missed! Bait has been plentiful in the bay which makes for plenty of time out wide. 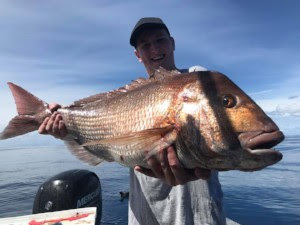 The Cuvier pins have been our goto with kings and snapper playing the game well ! As we move into March we should see ourselves fishing back down towards the aldys as the bigger fish begin to turn up, I’m looking forward to it! 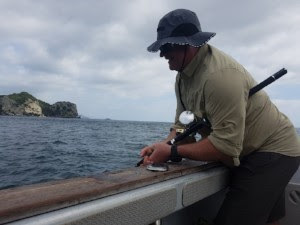 With a few fish being sharked we moved away from the areas and tried further north. The move was no loss as the fishing was just as good up there! 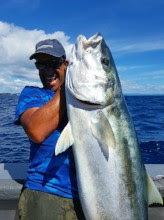 Some good sized kings being landed and some very consistent fishing had most days we are out! 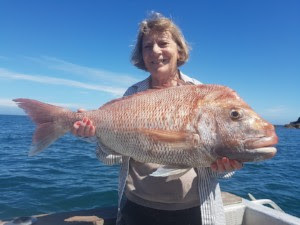 There has also been good variety around with some nice snapper coming aboard and also the odd tasty Hapuku. 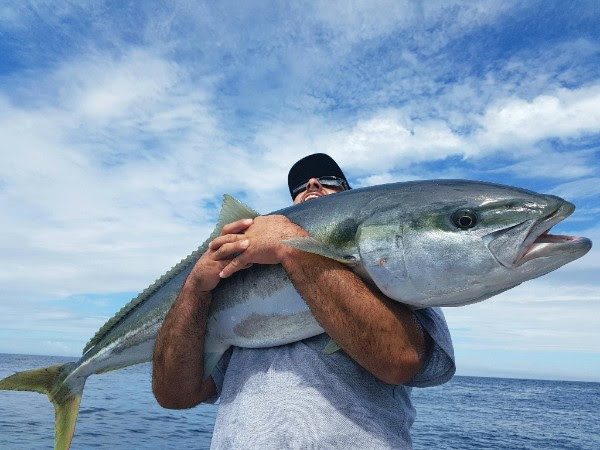 Bait in the bay has also been good with a few kingfish in the mix as well. A great month has been had and I am looking forward to the month that follows with hopefully some great weather!!! 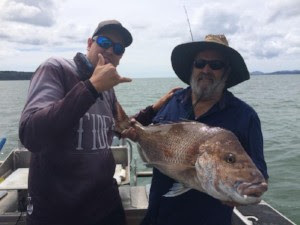 The month of February has been a bit up and down on the snapper with days getting our limits and the next day finding it hard work, using berley still had no effect. Flasher rigs have been the best method this month. The best part is the snaps are in top condition. Kings on the other hand are still in big numbers from the mussel farms and surrounding island to the Black rocks. 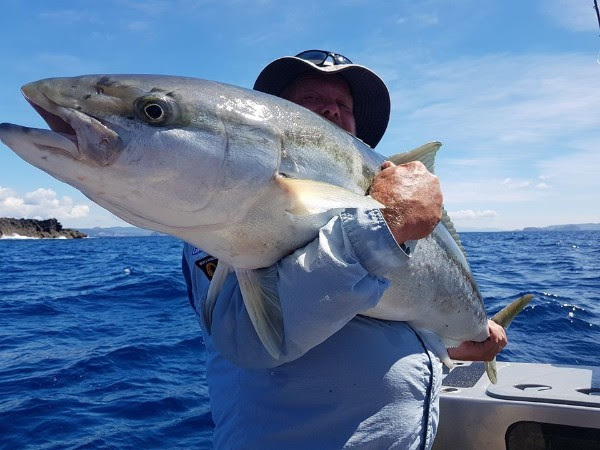 We have also been getting some good sized trevally near the farms. 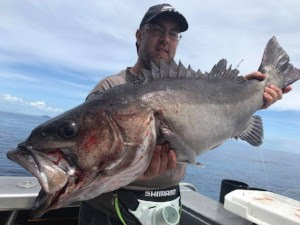 Channel Island has been on fire for the kings so far this season, getting some big kings and heaps of them, so book your trip now and lets get railed. Well summer has almost gone and as we roll into March, I can say that inspite of the mixed weather, the fish have stuck around. 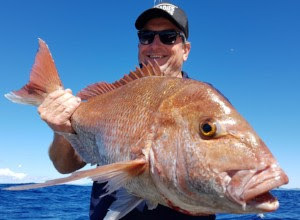 The target species, namely snapper and kingfish, have kept our anglers smiling, with some fine catches (and releases). 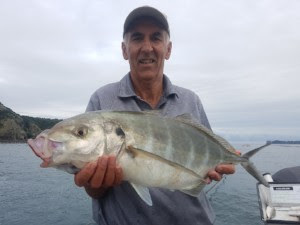 We have also caught other great eating table fish over the last month such as john dory, trevally and kahawai. 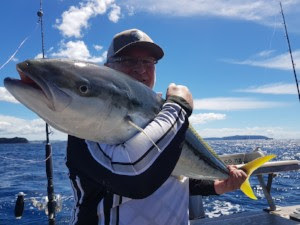 I have enjoyed the company of many overseas visitors lately, and they marvel at the beauty of the Bay, and the relaxed and rewarding fishing available to them on the Koro King. Can’t wait to get out there again.! Tight lines. P.S. the gamefish are still here, the water temperatures are still holding well..